You may not have seen Hans Karlsson, but it's more likely he's seen you. At the age of 91, he's logged over 600,000 miles on his Honda Gold Wing, reaching all corners of the globe, chalking up 76 countries in total. 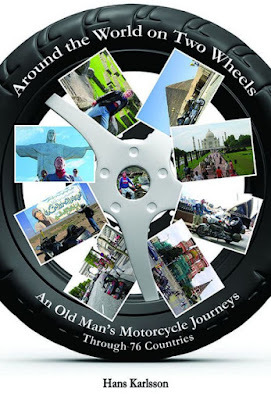 Recently, Karlsson returned to his home in Harahan, Louisiana to pen his new book, "Around the World on Two Wheels: An Old Man’s Motorcycle Journeys Through 76 Countries" (Kalmar Books), which details his course through the heart of Europe, Africa, and the Middle East, over a leg of Japan, and into the belly of South America. What motivates a 91-year-old to want to ride solo to such faraway destinations? An insatiable desire to see other countries and other cultures he says. It was Karlsson's son who got him on a motorcycle, however. In the Western Hemisphere alone he’s ridden from Alaska, to Argentina. Shipping his bike across oceans, he’s ridden through Paris, Moscow, New Delhi, Tokyo, Sydney, Istanbul, Tehran, Zurich, and a thousand other cities, towns, and villages along the way. After that first trip, Karlsson got a Gold Wing. "Around the World on Two Wheels: An Old Man’s Motorcycle Journeys Through 76 Countries" can be found on Amazon and wherever books are sold. "Around the World on Two Wheels: An Old Man’s Motorcycle Journeys Through 76 Countries," Kalmar Books, April, 2017, 373 pages, $17.95 paperback, also available in eBook, ISBN: 978-0-692-83553-1. Hans Karlsson, born in 1925, dreamed of traveling the world ever since he was a little boy growing up in the small town of Brunna, Sweden. But it was only later in life that Hans discovered his most cherished means of travel: motorcycle touring. He was 68 when he took his first long-distance ride. He’s 91 now and, in the intervening years, he estimates he’s logged more than 600,000 miles. And those miles have taken him from Alaska to Argentina, throughout the Middle East, all over Europe and Japan, into Africa, down under to Australia and New Zealand, and, quite literally, around the world.